These are a larger foot bones, versus the knuckle bones I sell. They are about 2.5 -3 inches long. Coyotes are a tenacious animal; tricky, skilled, smart, and playful. Their bones are are common to hoodoo practitioners...if they can obtain them that is. 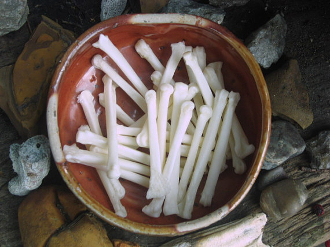 I find coyote bones due wonders t support out kind of magick; conjure, hoodoo, and cunning works. Animal bones are not as easy to find as they once were-not many of us are going out an hunting our own food nowadays. So, when I can, I offer bones a from a few animals in my area. Bones offer an entirely different feel to a mojo, especially if you are only versed in using roots and herbs in them. They bring a great spirit and powerful ashe' that can really seem to activate a mojo. I regularly carry a black cat bone with me.